An efficient and delicious way to feed a hungry family, this paella relies on condensed soup for its creamy flavor. The chicken and shrimp contrast nicely with the sweet bell peppers, and the delicately balanced herbs ensure that this paella will become an easy family favorite. Heat the olive oil in a paella pan. Add the chicken, and cook until browned on all sides. Add the onion and tomato soups, water, garlic, oregano, turmeric, thyme, salt, and pepper and cook, covered for 15 minutes. Mix in the rice, shrimp, bell peppers, roasted red bell peppers, and olives and cook, covered, for 25 minutes or until the liquid has been absorbed, the shrimp are cooked, and the chicken and rice are tender. 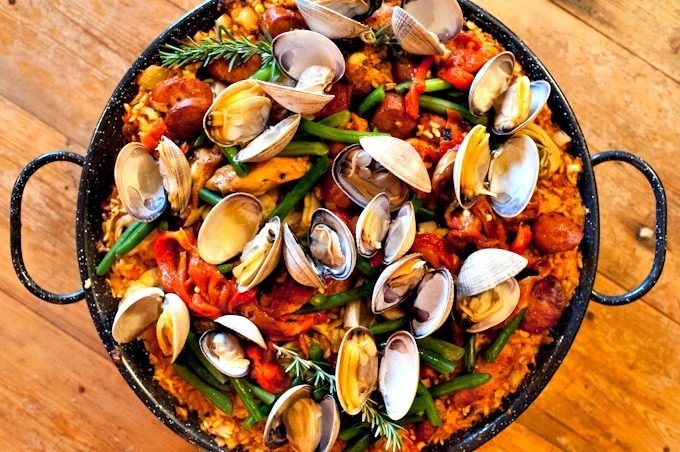 Uncover, allow the paella to cool, and serve.